NASA will launch Space Shuttle Endeavour on February 7, which will be the first of five launches this year before the shuttle fleet is retired. Endeavour will blast off from the Kennedy Space Center in Florida on a 13-day mission to the international space station. The mission will include three spacewalks, NASA said. The shuttle will also deliver the final U.S. portion of the space station. This portion will provide more room for crew members. 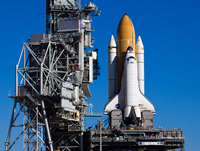 NASA plans to retire its space shuttles Discovery, Endeavour and Atlantis later this year. The space agency has been looking for places, such as museums, to house the shuttles after they are retired. Space Shuttle Discovery will be transferred to the Smithsonian National Air and Space Museum in Washington. The privilege of showing off a shuttle won't be cheap -- about $29 million, NASA said.